KNAC.COM - News - KNAC.COM NAMM 2015 Special On 'The Vault' Sunday! 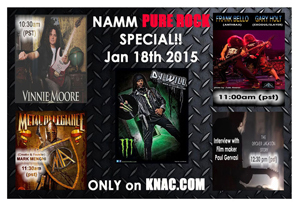 KNAC.COM NAMM 2015 Special On The Vault This Sunday! Be sure to listen in to KNAC.COM this Sunday, January 18th for a special NAMM 2015 edition of The Vault with DJ Will! All the fun begins at 10am (PST) as DJ Will will be playing Brand NEW PURE ROCK from AC/DC, U.D.O., NIGHT DEMON, MACHINE HEAD, SLIPKNOT, NAPALM DEATH, BULLET, AIR RAID, EXODUS and UFO!! You can listen Via Real Player, Windows Media, Win-Amp, Quicktime or Tunein Radio @ http://tunein.com/radio/The-Vault-p56842/ or on our main site at http://www.knac.com/listen.asp.